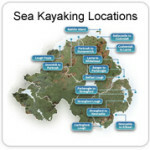 Don’t be fooled by the name Causeway Coast Kayak Association. 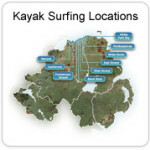 We do a lot more than paddle kayaks around the Causeway Coast. CCKA has a busy calendar of events throughout the year that should appeal to any paddler, regardless of their experience or interests. 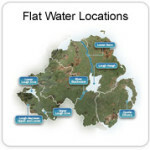 Flat water trips take place from September to June, usually at the weekend. They take place on the various locations including the Rivers Bann, Roe, Main, Blackwater, 6 Mile Water, Lough Neagh and Lough Beg. White water canoe paddles take place from October to April, usually on the weekend but occasionally during the week. 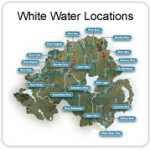 The locations are numerous but include the Upper Bann, Roe, Mourne, Owenkillew, 6 Mile Water, and Argivey. White water kayak paddles take place from October to April and are usually combined with canoe white water trips. They take place at various locations including the Upper Bann, Roe, Mourne, Owenkillew, 6 Mile Water, and Argivey. Surf sessions are suspended at present as the club has no qualified surf coaches or leaders. They would normally take place at White Rocks, East or West Strand beaches in Portrush. Coastal & open water trips take place from April to September. Usually along the North coast, Donegal or Scotland. There are also shorter evening trips from April to July on a Tuesday or Thursday evening. They normally take place along the North coast, Lough Beg or the Lower Bann. Other sessions covering a wide range of skills including rolling and Polo take place in Coleraine Leisure Centre. The pool events normally happen over Autumn and Winter and usually on a Friday evening. A small additional fee is required for pool sessions. Racing, Slalom and Surf competitions for all craft take place throughout the year. On average there is one event per month. The club actively takes part and sometimes organises events in the local Paddle4Sport League. The Paddle4Sport league events range from slalom to flat and white water racing. Some club members also take part in the annual Liffey Descent. 1-3 Star Personal Awards for Canoe & Kayak are organised throughout the year as required. The location will depend on the level of the award. Training and assessment is either organised and delivered internally by club coaches or by external organisations. Formal training and assessment for a qualification will normally involve the payment of an additional fee. 4 & 5 Star Leadership Awards for Canoe & Kayak are organised throughout the year as required. The location will depend on the level of the award. These can be organised by club or individual members. Training and assessment is usually delivered by private providers such as TNOC, Share or Inish Adventures. Formal training and assessment for a qualification will normally involve the payment of an additional fee. The club organises various courses related to Paddlesport, including Coaching, Safety & Rescue, First Aid, VHF Radio and Navigation Courses. These take place throughout the year as required. Courses with a recognised qualification will usually involve payment of an additional fee. Overnight and weekend events take place throughout the year as part of the annual programme of events. The club organises a number of events which could involve wild camping, staying in a bothy or even living it up in a B&B. The club usually tries to get a weekend in Donegal or Wicklow once a year. The club has access to a couple of traditional sailing/rowing boats called Drontheims. Members can also use the club powerboat (if qualified). Sailing events take place at various times throughout the year but are dependant on the weather. Club members have recently attended a number or gatherings and regattas. Sailing events are open to all club members. Various social events take place throughout the year as part of the annual programme of events. Most paddles and events have a social side to them. The club normally has a couple of dedicated social events around December. A charity event called the Paddle of Light and the Christmas dinner. Various meetings take place throughout the year as part of the annual programme of events. These include planning meetings in spring and autumn and the Annual general meeting (AGM) in early December. All members are encouraged to attend club meetings.